Electric heaters for generating heat for your process application are available in both standard pre-engineered as well as custom designs. Our electric heating elements are constructed of 96% pure magnesium oxide due to its high dielectric and optimal heat transfer effisiency. With an electric heater you can expect precise temperature control day in and day out. Circulation heaters are an ideal solution for creating heat and enhancing normal immersion heaters performance. They are designed to heat pressurized circulating fluids to provide effective, precise heating to steam, oil, water and other gases. These heaters are composed of all-in-one units with a heater mounted inside an insulated tank. They are made of a flanged or a screw plug immersion heater that is inserted into a pressure vessel or a pipe body. Heaters have inlet and outlet piping where the liquid or gas goes through the tank in order to reach the chosen temperature. specific types of liquids, (water, oil, heat transfer fluid, and corrosive solutions). These heaters are easy to maintain and install and built for safety and efficiency. Flange heaters are available in special sizes, wattages, and materials upon request. Duct heaters are composed of open coil, tubular or finned tubular heating elements that are either flanged or inserted in the duct. They are offered in two styles: air duct heaters and process heaters. Air duct heaters are primarily used in air flowing ventilation systems and comfort heating applications while process duct heaters are mainly used for industrial process heating applications (ovens that require forced circulation or re-circulated air). 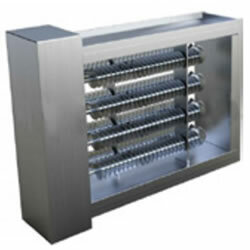 We will design and configure your electric duct heaters according to your specifications. Duct heaters are easily adaptable solutions for most non- pressurized air-heating systems.